A collection of costumes and props from hit US drama Mad Men has been donated to the Smithsonian National Museum of American History. Cast members Jon Hamm, John Slattery, Christina Hendricks and creator Matthew Weiner attended an event in Washington to present the items to the museum. 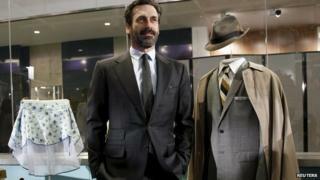 They included ad man Don Draper's trademark grey suit and fedora and other real 1960s-period props. They will be featured as part of an exhibit on American culture in 2018. The museum's entertainment curator, Dwight Blocker Bowers, said Mad Men producers did the best research he had ever seen for a TV show, with meticulous detail to create the look of a 1960s ad agency. Among the donated props included shaving kits, toothbrushes, bottles of alcohol, a packet of cigarettes and watches. Weiner said he was thrilled items from the show might one day be seen during a school field trip at the Smithsonian. Charlie Collier, the president of US network AMC which airs the show, said the show's creators were honoured Draper's suit would join Dorothy's ruby slippers from The Wizard of Oz and other objects from entertainment history at the museum. "You know, they say that all good things must come to an end, and all great things come to the Smithsonian," he said. Mad Men returns to US screens for its final seven episodes on 5 April.